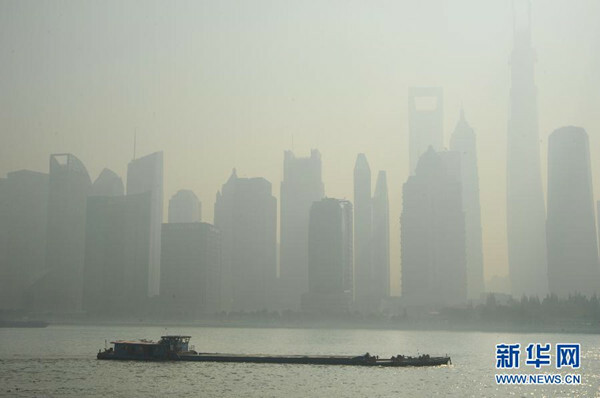 A coordinated effort to fight air pollution over the Yangtze River Delta was launched in Shanghai yesterday. As per the agreement, Shanghai and the three neighboring provinces — Zhejiang, Jiangsu and Anhui — will share information and take joint action to fight air pollution in the region. Shanghai will have to reduce the main air pollutants, essentially PM2.5, by 20 percent, a target set by the Ministry of Environmental Protection yesterday with local governments handed the charge to set a time frame for its implementation. In the joint action, Shanghai and neighboring cities will keep each other updated about regional air quality condition and cooperate in scientific researches on air pollution. They will also try to achieve a unified standard over energy conservation and emission cuts. Restriction over coal consumption was listed as one of the main tasks in the fight against air pollution in the delta area. Cities and provinces were urged to push for a more environmentally friendly energy supply structure. Other tasks include the rectification of high-pollution enterprises, elimination of high-emission vehicles and upgrading oil products, as well as to strict control over dust emission and burning of straw. The delta region shall also work on a unified air pollution warning system and act jointly once the warnings are issued. Shanghai enjoyed its first day of perfect air condition on Monday after consecutive hazy and polluted days. Only eight days out of 31 days last month had air quality that were good or perfect. It was one of most polluted winter the city has seen. In each of the previous four Decembers, air quality was good or excellent for at least 20 days. The ministry yesterday gave China's 31 provinces, municipalities and autonomous regions the targets to reduce main air pollutants, essentially PM2.5, by 5 to 25 percent, Xinhua news agency reported. Shanghai, Jiangsu, Zhejiang, Shandong and Shanxi will have to cut the indices by 20 percent, followed by 15 percent for Guangdong and Chongqing and 10 percent for Inner Mongolia Autonomous Region. Eleven provinces were given PM2.5-reducing tasks, including an annual 25 percent decrease — the highest — for Beijing and neighboring Tianjin municipality and Hebei Province, according to a liability paper signed by the regions and the environment ministry. Other regions were ordered to cut their PM10 readings by 5 to 15 percent. The State Council is mulling a system to evaluate each provincial-level government's progress. Those failing to reach their goals will have to provide explanations and make corrections.